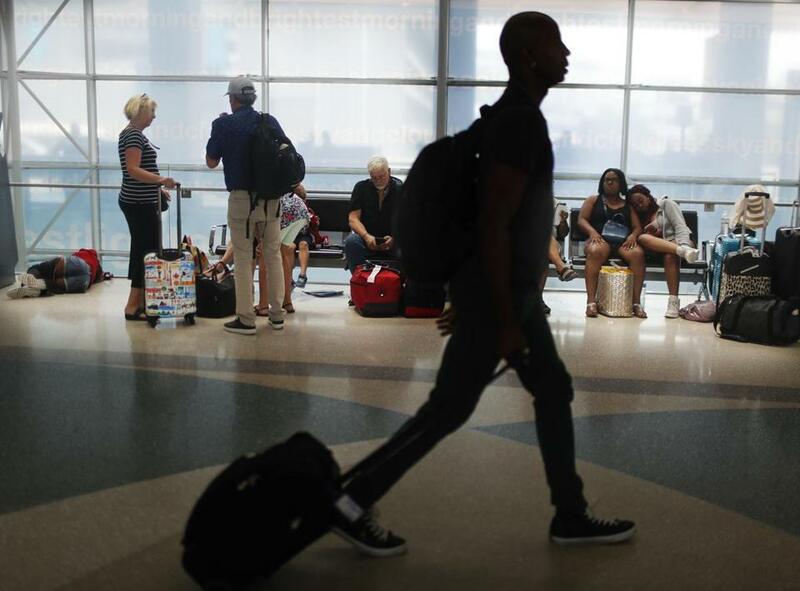 Travelers gather on benches to wait for delayed and arriving flights as others rush to their gate at the Fort Lauderdale Hollywood International Airport. But some air marshals, in interviews and internal communications shared with the Globe, say the program has them tasked with shadowing travelers who appear to pose no real threat — a businesswoman who happened to have traveled through a Mideast hot spot, in one case; a Southwest Airlines flight attendant, in another; a fellow federal law enforcement officer, in a third. TSA officials, in a written statement to the Globe, broadly defended the agency’s efforts to deter potential acts of terror. But the agency declined to discuss whether Quiet Skies has intercepted any threats, or even to confirm that the program exists. Release of such information “would make passengers less safe,” spokesman James Gregory said in the statement. Already under Quiet Skies, thousands of unsuspecting Americans have been subjected to targeted airport and inflight surveillance, carried out by small teams of armed, undercover air marshals, government documents show. The teams document whether passengers fidget, use a computer, have a “jump” in their Adam’s apple, or a “cold penetrating stare,” among other behaviors, according to the records. All US citizens who enter the country are automatically screened for inclusion in Quiet Skies — their travel patterns and affiliations are checked and their names run against a terrorist watch list and other databases, according to agency documents. The program relies on 15 rules to screen passengers, according to a May agency bulletin, and the criteria appear broad: “rules may target” people whose travel patterns or behaviors match those of known or suspected terrorists, or people “possibly affiliated” with someone on a watch list. The full list of criteria for Quiet Skies screening was unavailable to the Globe, and is a mystery even to the air marshals who field the surveillance requests the program generates. TSA declined to comment. Quiet Skies represents a major departure for TSA. Since the Sept. 11 attacks, the agency has traditionally placed armed air marshals on routes it considered potentially higher risk, or on flights with a passenger on a terrorist watch list. Deploying air marshals to gather intelligence on civilians not on a terrorist watch list is a new assignment, one that some air marshals say goes beyond the mandate of the US Federal Air Marshal Service. Some also worry that such domestic surveillance might be illegal. Between 2,000 and 3,000 men and women, so-called flying FAMs, work the skies. The TSA, while declining to discuss details of the Quiet Skies program, did address generally how the agency pursues its work. Experts on civil liberties called the Open Skies program worrisome and potentially illegal. George Washington University law professor Jonathan Turley said Quiet Skies touches on several sensitive legal issues and appears to fall into a gray area of privacy law. Geoffrey Stone, a University of Chicago law professor chosen by President Obama in 2013 to help review foreign intelligence surveillance programs, said the program could pass legal muster if the selection criteria are sufficiently broad. But if the program targets by nationality or race, it could violate equal protection rights, Stone said. Asked about the legal basis for the Quiet Skies program, Gregory, the agency’s spokesman, said TSA “maintains a robust engagement with congressional committees to ensure maximum support and awareness” of its effort to keep the aviation sector safe. He declined to comment further. Beyond the legalities, some air marshals believe Quiet Skies is not a sound use of limited agency resources. Several air marshals, who spoke on the condition of anonymity because they are not authorized to speak publicly, told the Globe the program wastes taxpayer dollars and makes the country less safe because attention and resources are diverted away from legitimate, potential threats. The US Federal Air Marshal Service, which is part of TSA and falls under the Department of Homeland Security, has a mandate to protect airline passengers and crew against the risk of criminal and terrorist violence. John Casaretti, president of the Air Marshal Association, said in a statement: “The Air Marshal Association believes that missions based on recognized intelligence, or in support of ongoing federal investigations, is the proper criteria for flight scheduling. Currently the Quiet Skies program does not meet the criteria we find acceptable. Late last year, Representative Jody Hice, a Georgia Republican, introduced a bill that would require the Federal Air Marshal Service to better incorporate risk assessment in its deployment strategy, provide detailed metrics on flight assignments, and report data back to Congress. Without this information, Congress, TSA, and the Department of Homeland Security “are not able to effectively conduct oversight” of the air marshals, Hice wrote in a letter to colleagues. Hice’s bill, the “Strengthening Aviation Security Act of 2017,” passed the House and is awaiting consideration by the full Senate. The Globe, in its review of Quiet Skies, examined numerous TSA internal bulletins, directives, and internal communications, and interviewed more than a dozen people with direct knowledge of the program. The purpose of Quiet Skies is to decrease threats by “unknown or partially known terrorists; and to identify and provide enhanced screening to higher risk travelers before they board aircraft based on analysis of terrorist travel trends, tradecraft and associations,” according to a TSA internal bulletin. The criteria for surveillance appear fluid. Internal agency e-mails show some confusion about the program’s parameters and implementation. Travelers remain on the Quiet Skies watch list “for up to 90 days or three encounters, whichever comes first, after entering the United States,” agency documents show. Travelers are not notified when they are placed on the watch list or have their activity and behavior monitored. Quiet Skies surveillance is an expansion of a long-running practice in which federal air marshals are assigned to surveil the subject of an open FBI terrorism investigation. According to a TSA bulletin, the program may target people who have spent a certain amount of time in one or more specific countries or whose reservation information includes e-mail addresses or phone numbers associated to suspects on a terrorism watch list. @globe.com and on Twitter @JanaWinter. This investigation was made possible through the Spotlight Investigative Journalism Fellowship, a social impact initiative of Participant Media. For more, go to www.spotlightfellowship.com.